Set in 1986, The Commitments tells the story of a group of restless young Dubliners who come together to bring soul music to the people of Dublin. Based on Roddy Doyle's popular novel, which was adapted into a film in 1991, The Commitments enjoyed a two year long run on the West End despite receiving a mixed critical response, and is now bringing soul to theatres around the UK on its very first tour. Whether or not The Commitments can be considered an enjoyable show is all down to what exactly audiences are hoping to gain from it. If a gritty drama about life in 1980s Dublin, combined with all the bells and whistles of a mega West End musical hit, is what's sought after then unfortunately the show may disappoint. However, if audiences are looking for a jukebox musical packed with a litany of toe-tapping tunes then The Commitments is just what the doctor ordered. There are, of course, a few technical elements worth admiring. Soutra Gilmour's sets, whilst lacking some of the gears and cogs which made the show's West End predecessor stand out, capture a sort of homespun warmth amid the dour concrete and laminate of 1980s Dublin. The atmosphere is fuelled by Jon Clark's gig-like lighting design, which gives the show's biggest musical numbers a bit of extra impact. But it is impossible to ignore the fact that what The Commitments lacks is a juicy, compelling plot, and its absence really does affect the show's overall pleasurability. The Commitments' band of pugnacious wannabe musicians are portrayed well by the cast, whose musicianship is equally impactful, but they're given virtually nothing to do and nowhere to go, and as such their seemingly never ending cavalcade of pub brawls and gratuitous effing and blinding gets tired quickly. A lack of character development for supporting characters is also noticeable, which is a shame, as the entire ensemble work tirelessly throughout the show. The lack of plot translates to a slightly lagging pace, but the cast do their best to combat this with their energetic performances. 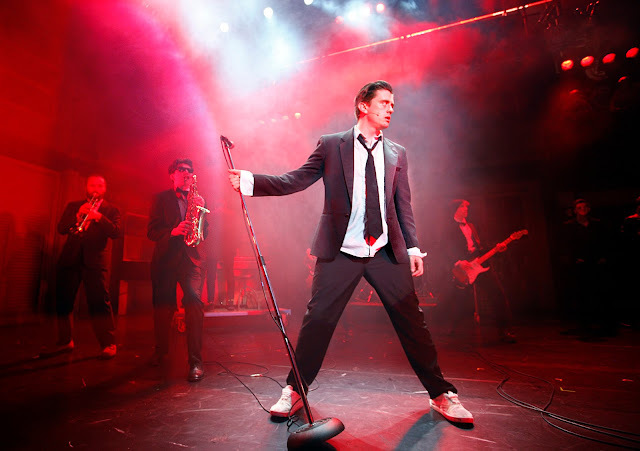 Andrew Linnie is convincing as Jimmy, the band's passionate leader, and The Commitmentettes are played with vigour and bite by Amy Penston, Leah Penston and Christina Tedders. However, the show really belongs to Brian Gilligan's Deco, whose transition from slob to manic frontman with an ego problem is perfectly handled. He makes the most of each second he is on stage, bounding around and delivering suitably soulful vocals almost nonstop. The show's song list is full of instantly recognisable classics, and while they often do little to move the story along, they're definitely highlights. The best really is saved until last though, with Brian Gilligan stirring the audience to clap along to familiar crowd-pleasers like Mustang Sally and Try A Little Tenderness. There's no doubt that The Commitments goes out on a high. It's just a shame that the high follows a pretty slow couple of hours. Much like several of its scrappy protagonists at various points during the show, the stage adaptation of The Commitments is all mouth and no trousers.